Easy Cheesy Potatoes Au Gratin! – This dish looks so fancy but it is so incredibly simple! 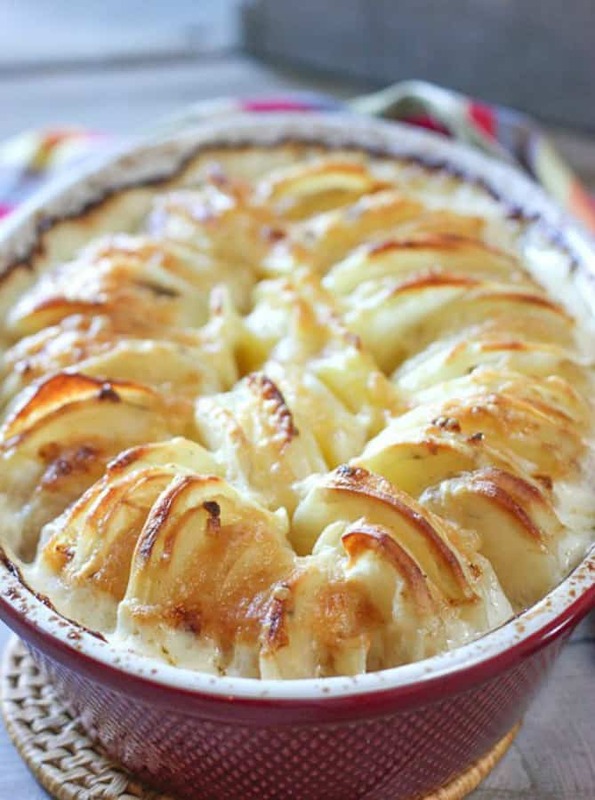 Toss sliced potatoes with fresh cream, garlic and cheese then turn those potatoes on their side! VIDEO BELOW WILL SHOW YOU HOW EASY THIS RECIPE TRULY IS! Don’t touch that dial! I know, these look sooooo hard to make, but believe me when I say they are incredibly easy! Four ingredients and no fancy equipment needed! 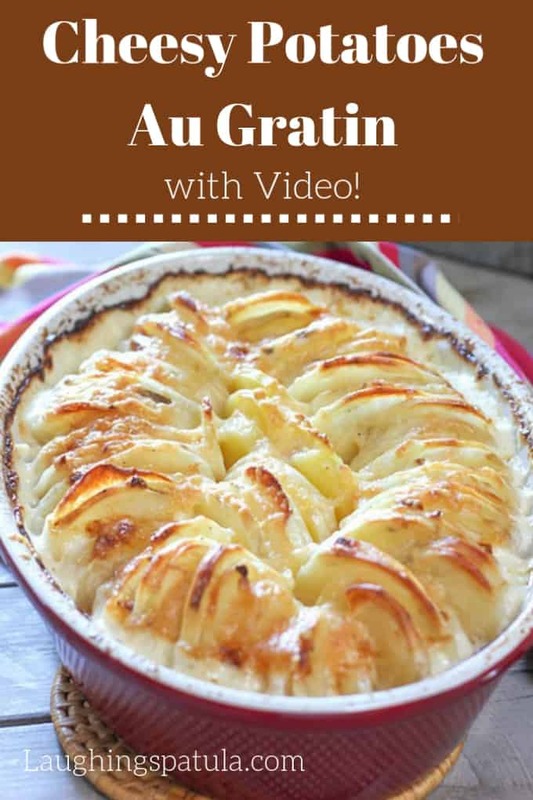 How to make Cheesy Au Gratin Potatoes! We didn’t use a mandolin slicer. We didn’t even heat the cream before it was poured in. 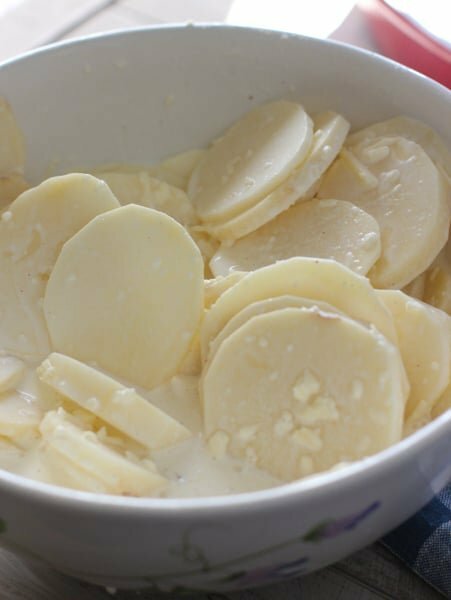 We simply sliced the potatoes with a trusty sharp knife and tossed them in cheese, garlic and cream….heavy cream my friends. No messing around here. Line the potatoes up vertically in a 2 quart baking dish. Pour the remaining cream over these beauties and into the oven it goes! They come out beautiful every time. I used large russet potatoes. You will need 6 of them. Bigger the tater, the prettier this dish will be. Cut off the small ends of the potatoes and discard or save for breakfast (yum!). This keeps the potato slices uniform. But it doesn’t have to be perfect! You can see there are various sizes of potato and the dish still came out very pretty. DO NOT PACK THOSE TATERS TO TIGHT. They need just a little wiggle room. Depending on how thick your potatoes are, and how large your cooking vessel is, the cooking time can vary on this dish. Remove a potato slice from the middle to check. If still a little firm, cook another 10 minutes. OVERNIGHT: Assemble the night before, cover and refrigerate. Warm up on the counter 20 minutes or so before baking. Need an easier tutorial of this delicious dish? Check out this video below! Get ready to impress your friends and family with this masterpiece…they will never guess how easy it really was! This impressive looking but incredibly easy to make casserole is not only pretty, but tastes amazing! Don't let the fancy exterior fool you, this is a breeze to make! In medium bowl, combine Gruyere and Parmesan cheeses. Remove 1/2 cup and set aside for topping. In a large bowl, add cream, garlic, cheese, salt and pepper. Add potato slices to cream mixture and toss with your hands until every slice is coated, making sure to separate any slices that are sticking together. Butter a 2-quart casserole dish. Begin to place potatoes vertically in dish. Continue placing potatoes in the dish, working around the perimeter and into the center until all the potatoes have been added, being careful not to pack the potato slices too tightly. 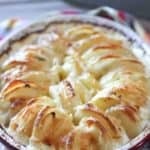 Pour the excess cream and cheese mixture over the potatoes until the mixture comes halfway up the sides of the casserole. You may not need all the cream sauce. Cover dish tightly with foil and bake for 45 minutes. Remove foil and continue baking an additional 30 minutes or until the top is pale golden brown. TIP: Pull a potato slice from the center of the casserole to check for doneness. If still too firm, cook an additional 10 minutes. 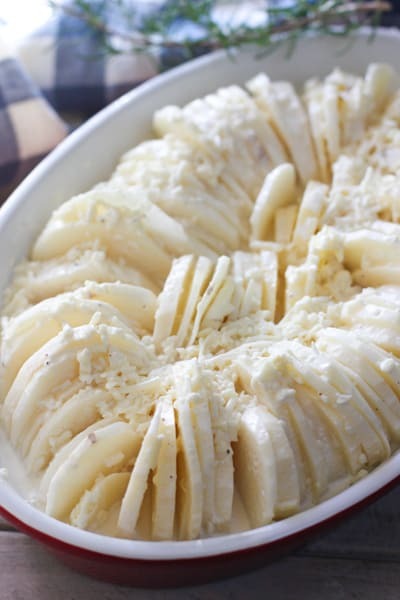 Top with the remaining cheese you set aside and bake for another 10 minutes. Remove from oven and allow to cool 10 minutes before serving. Leftovers? Chop them up the next day and use as hash browns! Heck ya! I used large russet potatoes. You will need at least 6 of them. Bigger the tater, the prettier this dish will be. Cut off the small ends of the potatoes and save for breakfast (yum!). This keeps the potato slices uniform. But it doesn't have to be perfect! You can see there are various sizes of potato and the dish still came out beautiful. OVERNIGHT: Assemble the night before, cover and refrigerate. Let it warm up a bit on the counter, about 20 minutes or so, before baking. Excited to make this recipe! Can you use Red Skin potatoes instead of Russet? I know they are not as large, but I already have Red Skin on hand. Hi Katherine, yes, you can! They are a little firmer than russets so might take another 10-15 minutes in the oven depending on the size of the potato. Check to be sure they are done in the middle by removing one small slice and testing. Let us know how it turned out please! Thank you so much for the quick reply! As an update – This dish was absolutely amazing. I used the red skin potatoes I had on hand, and it was to die for. Can’t wait to make it again! Can you use any type of cheese, such as havarti? Hi Kate – I’m afraid not. Havarti is a very fatty cheese and it would leave the casserole oily. Swiss is an option as is cheddar. Harder cheeses would work best for this recipe. You don’t have to…more of a personal preference. Could you use regular milk instead of heavy cream? Sorry but no. It would not be thick. If you only have milk, you can make a white sauce in lieu of the cream. 2 cups of milk cooked in a saucepan with 4 tablespoons flour. Heat till bubbling and thick. Hope that helps!